ENTRANCE HALL 7′ 5" x 7′ 1" (2.27m x 2.18m) With wood block foor, picture rail, radiator and power point. CONSERVATORY 11′ 10" x 7′ 9" (3.61m x 2.37m) With a radiator, power points and double glazed door giving access to the rear gardens. MUSIC ROOM 11′ 0" x 9′ 10" (3.36m x 3.01m) With woodblock flooring, radiator, power points and double glazed window giving aspect over the front of the property. KITCHEN/DINER 20′ 7" x 10′ 7" (6.29m x 3.25m) Having a range of fitted oak units comprising wall cupboards with glazed fronted doors, wine rack, granite work top surface, Belfast sink with a range of drawers and base cupboards beneath and plumbing for automatic washing machine. Five ring gas hob with extractor, electric double oven and grill, integral dishwasher, part tiled walls, power points, tiled floor, under stairs storage area and double glazed window giving aspect over the rear gardens. CELLAR ROOM ONE 14′ 0" x 10′ 0" (4.28m x 3.05m) With a wall mounted boiler supplying the radiators and domestic hot water, power and light. CELLAR ROOM TWO 9′ 11" x 6′ 0" (3.04m x 1.83m) Offering light and storage space. INNER HALLWAY (OFF THE KITCHEN) With a radiator and coved ceiling. GROUND FLOOR BEDROOM 15′ 11" x 12′ 5" (4.87m x 3.81 MAXm) With double panelled radiator, a range of fitted bedroom furniture, power points, coved ceiling and double glazed window giving aspect over the front of the property. ENSUITE BATHROOM 9′ 6" x 5′ 8" (2.91m x 1.74m) Having a four piece suite comprising a panelled bath, pedestal wash hand basin, low flush w.c, bidet, radiator and part tiled walls. Access to roof space. 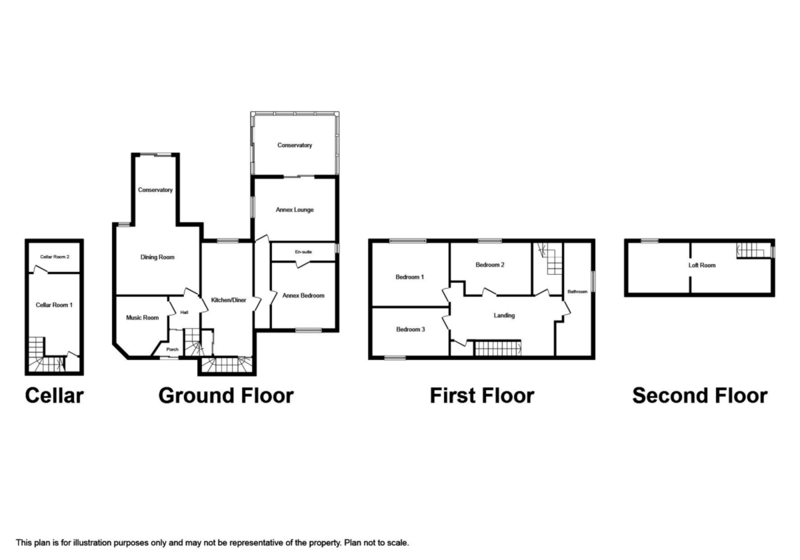 ANNEX CONSERVATORY 12′ 5" x 11′ 2" (3.80m x 3.41m) With power points and door giving access to rear gardens. LOFT ROOM 26′ 6" x 8′ 8" (8.08m x 2.66m) Ladder access. With two radiators, power points and dual aspect with double glazed windows. BEDROOM ONE 14′ 5" x 10′ 4" (4.41m x 3.17m) With radiator, picture rail, power points and double glazed window giving aspect over the rear of the property. BEDROOM TWO 13′ 11" x 8′ 7" (4.26m x 2.63m) With picture rail, radiator and double glazed window giving aspect over the rear of the property. BEDROOM THREE 13′ 11" x 7′ 3" (4.25m x 2.21m) With double panelled radiator, power points and double glazed window giving aspect over the front of the property. BATHROOM 10′ 7" x 6′ 11" (3.24m x 2.13m) Having a four piece suite comprising a corner panelled bath, purpose built shower cubicle, pedestal hand wash basin, low flush w.c. Chrome heated towel rail, storage cupboard, inset spot lighting to ceiling and tiled walls. OUTSIDE The property is approached over a brick paved driveway providing off-road parking with gravelled gardens to the front with low bearing shrubs for ease of maintenance. The gardens to the rear are south facing and well established with a private paved patio area with steps leading down to the remainder of the garden which is lawned with maturing shrubs and a timber constructed GARDEN STORE. The gardens are bounded by timber fencing. SERVICES Mains electric, gas, water and drainage are believed to be available or connected to the property. All services and appliances are not tested by the Selling Agent. DIRECTIONS From the Prestatyn office turn right and continue along Meliden Road, over the traffic lights. Take the fifth right and proceed along Aberconway Road and the property can be seen half way up the road, on the right hand side by the way of a ‘For Sale’ sign.